Gilcrease Museum is a museum located northwest of downtown Tulsa, Oklahoma. The museum houses the world's largest, most comprehensive collection of art of the American West, as well as a growing collection of art and artifacts from Central and South America. 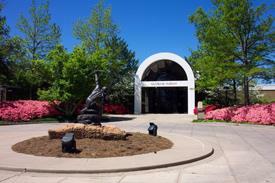 The museum is named for Thomas Gilcrease, an oil man and avid art collector. Thomas Gilcrease grew up in the Creek Nation, located within present day Oklahoma. At the turn of the 20th century the federal government distributed lands held by American Indian tribes to private citizens. His tribal membership entitled him to an allotment of 160 acres (0.65 km2) located south of Tulsa near Glenpool. The land subsequently became part of one of Oklahoma's major oil fields, and Gilcrease proved to be an able businessman. In 1922, he founded the Gilcrease Oil Company, and in less than ten years had greatly expanded his original holdings. Thomas Gilcrease traveled extensively in Europe during the 1920s and 1930s. His visits to European museums inspired him to create his own collection. Pride in his American Indian heritage and interest in the history of the American West provided a focus for his collecting. Gilcrease purchased his first oil painting titled Rural Courtship by Daniel Ridgway Knight in 1912 for $1,500, but most of the collection was amassed after 1939. The first Gilcrease Museum opened at his oil company headquarters (at that time located in San Antonio, Texas) in 1943. Within a few years, he returned to Tulsa with his oil company and his growing collection. He opened a gallery for public viewing on his Tulsa estate in 1949. Karp, Walter, "Thomas Gilcrease And His Western Museum", American Heritage, February 1990. "How Creek Indian number 1501 repaid a debt." ^ a b c Erwin, Sarah. Encyclopedia of Oklahoma History and Culture. "Gilcrease Museum." ^ Don C. Wood. "National Register of Historic Places Inventory Nomination Form: Maidstone Manor Farm" (PDF). State of West Virginia, West Virginia Division of Culture and History, Historic Preservation. Retrieved 2011-06-02. ^ Shannon Muchmore, Mutually beneficial Museum's attendance, fundraising up, Tulsa World, July 5, 2009. Gilcrease is the only known art museum to have these educational and inspirational gardens on one site nestled in the Osage Hills. Special garden tours are available by appointment. Using the Gilcrease collections as a guide, themed gardens have been developed on twenty-three of the museum's 460 acres (1.9 km2). These gardens enhance the museum's collections by reflecting gardening styles and techniques from four time periods in the American West: Pre-Columbian, Pioneer, Colonial, Victorian, as well as a rock garden. 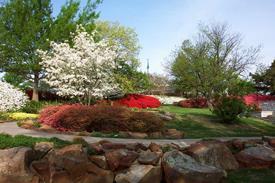 Gilcrease Museum's gardens draw thousands of visitors a year. The archival collection at Gilcrease Museum contains over 100,000 books, manuscripts, documents, and maps ranging from 1494 to the present. Items of special interest are: A letter dictated and signed by Diego Columbus in 1512, the Cortez Decree of 1521, copies of the Declaration of Independence and the Articles of Confederation (signed by Benjamin Franklin), and a letter written by Thomas Jefferson dated July 1, 1776. The museum also has a substantial collection of manuscripts by Cherokee principal chief John Ross and Choctaw Chief Peter Pitchlynn. These diverse materials help tell the story of the many peoples and cultures that have made the history and exploration of the new world unique and complex. Especially noteworthy in the archaeological collections at Gilcrease Museum are items from the Mississippi valley region (present-day Illinois and Arkansas), the southwestern U.S. (Colorado, New Mexico, and Arizona), and ancient Mexico. Gilcrease Museum has one of the most important collections of pre-Columbian projectile points (arrow and spear heads) in North America, and has become a resource that is regularly consulted by archaeologists. The museum also has a research facility containing sliding glass display shelves for artifacts and a computer database system to help find various pieces. This facility, the Kravis Discovery Center, also has numerous "touchable" items for a hands-on experience for its visitors. At Gilcrease Museum, the anthropology collections and the work of the department of anthropology focus on the cultural history of North, Central, and South America. The collections comprise 300,000 artifacts, covering prehistoric and historic archaeology and ethnographic materials from native American, Hispanic, pre-Columbian, and Anglo-American cultural traditions. The ethnographic and historical materials span the period from European exploration of the Americas to the current day. On July 1, 2008 the University of Tulsa assumed management of the museum through a public-private partnership with the City of Tulsa. Gilcrease Museum has a long-term native American exhibition. Enduring Spirit: Native American Artistic Traditions permits the museum to showcase some of the major strengths of the permanent collection as well as provide a much more comprehensive and integrated presentation of the museum's native American art collections. Thomas Gilcrease believed that the story of the American West could be told through art and that the history of the native Americans and his own American Indian heritage could be preserved through painting, sculpture, and other forms of art. He was a patron to a number of native American artists of his time and purchased over 500 paintings by 20th century native American artists alone. Many famous American artists have their work displayed in Gilcrease Museum's American West Gallery. Albert Bierstadt, Frederic Remington, Thomas Moran, and Joseph Henry Sharp are featured prominently. Also on display at the Gilcrease Museum are works by Charles Marion Russell, Alexandre Hogue, and John James Audubon. After his death in 1955, the widow of artist William Robinson Leigh gave his New York studio to the Gilcrease Museum. Thomas Gilcrease then deeded his collection to the city of Tulsa in 1955. In 1958, the Gilcrease foundation conveyed the museum buildings and grounds to the city of Tulsa. In addition, Gilcrease committed oil property revenue to Tulsa for assistance in maintaining the museum until the $2.25 million bond was fully repaid. In the years following the transfer of the collection, Thomas Gilcrease continued to fund archaeological excavations and acquire additional materials for the collection. Upon his death in 1962, he bequeathed to the museum the material he had collected during his final years.